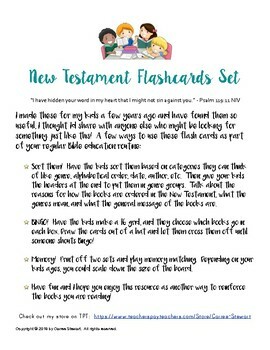 New Testament Books of the Bible FLASHCARDS (with Sort Headers) - Happy EASTER! I made these for my kids a few years ago and have found them so useful, I thought I’d share with anyone else who might be looking for something just like this! 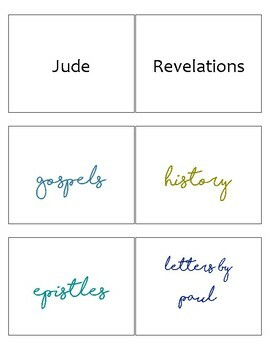 This set includes flashcards for all books of the New Testament Bible, and heading cards for sorting by Gospels, History, Epistles, Letters by Paul, Letters by Others, Personal, Pastoral. Sort them! 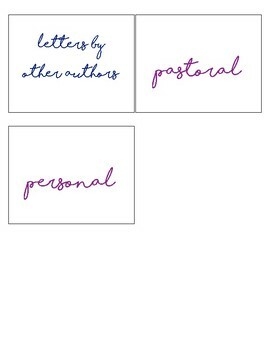 Have the kids sort them based on categories they can think of like genre, alphabetical order, date, author, etc. Then give your kids the headers at the end to put them in genre groups. 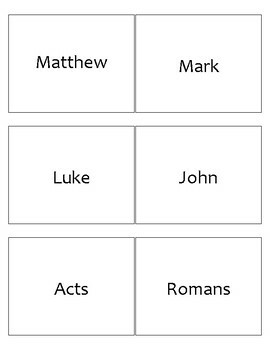 Talk about the reasons for how the books are ordered in the New Testament, what the genres mean, and what the general message of the books are. BINGO! Have the kids make a 16 grid, and they choose which books go in each box. Draw the cards out of a hat and let them cross them off until someone shouts Bingo! Memory! Print off two sets and play memory matching. Depending on your kids ages, you could scale down the size of the board. Have fun and I hope you enjoy this resource as another way to reinforce the books you are reading!